South Korea's industry ministry said Thursday it has reached a consensus with Britain to promptly prepare follow-up measures as London moves to leave the European Union. 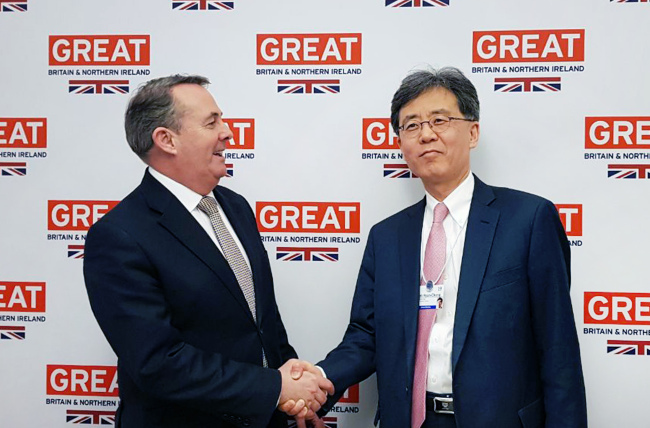 The Ministry of Industry, Trade, and Energy said Trade Minister Kim Hyun-chong met his counterpart Liam Fox, sharing opinions on their post-Brexit relationship, including possibly clinching a separate free trade agreement with London when the departure happens. The two agreed that they should prepare various measures to minimize the impact on bilateral trade, the industry ministry said, including emergency programs to cope with a possible no-deal Brexit. No-deal Brexit refers to Britain leaving the union without reaching an agreement on its post-Brexit relationship. Britain has said it wishes to maintain a stable relationship with South Korea in terms of trade, as it acknowledges Asia's fourth-largest economy as one of its major trading partners. The ministry said it plans to prepare for detailed follow-up measures based on the latest meeting with the British counterpart. The trade volume between the two countries came to an all-time high of $14.4 billion in 2017, helped by the free trade agreement with the EU. It reached $11.6 billion in the January-November period of 2018.